This page is an older page from my site that I carried over to the new site. 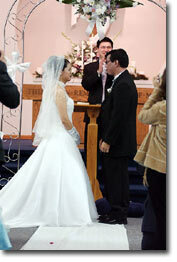 I had created it to answer questions from couples about other people taking pictures on wedding day. When I began wedding photography it was much more common for certain wedding photographers to want to ban everyone else from taking pictures on wedding day. Fortunately, as time has gone on that practice is becoming much less common these days - I suspect this partly due to the increase in popularity of smartphones. First, EVERYONE has one and banning them would be tough. Second, the smartphones work well in low light and don't require the bright flashes that film-based cameras typically required. I decided to carry this information over to my new site - even though I need to get updated photos for the page at some of my upcoming weddings. 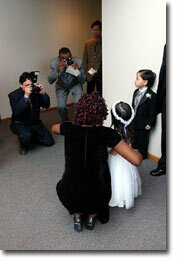 the day - even during the formal photo sessions. 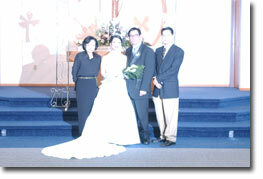 The other person's flash might mess up the professional's exposure. This was a bigger issue before smartphones - as smarthones generally don't use flash or have a very weak flash. Presonally, it's been a long time since I've had photos ruined by another camera's flash - but, it has happened (see picture at right). The other person who is taking the photo might distract the eyes of the people in the image. This can happen, but I've found it's not really an issue if I am doing what it takes to draw attention to myself during the session (often a louder voice and exagerated hand motions). The other person might give a copy of the picture to the bride and groom who might not buy a print from the professional. For me, my pricing is setup so I am not concerned about this, not to mention my photos had better turn out a whole lot better than the person shooting over my shoulder with a smarthone! who are taking pictures during the day. Attending the wedding of a friend is a special and exciting event - and people often like to take snapshots to help them remember the day. As long as it doesn't interfere with my job, I will often go a bit out of my way so that other people's photos will turn out well. In the example at right, I was standing directly behind the group when I noticed they were about to take a picture. I moved to the side, took a photo of them, and then moved even further away so I wouldn't be in their picture. Guess what? Sometimes people accidentally get in the way. With so many people at a wedding and so many pictures being taken throughout the day, it's a given that sometimes people will accidentally get in the way. I work at minimizing these instances by waiting for people to walk past, or, letting them know I am about to take a picture. When accidents happen, I simply reshoot the image. and they move when they realize the situation. There are also times when people who are taking pictures will inadvertently get in my way - as the photos at right show. 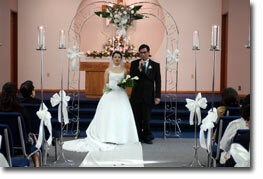 Several people had stepped into the aisle during the ceremony. As I mentioned above, I work to accommodate other photographers, and, since I had already gotten some close up images and nothing important was immediately scheduled, I was OK with them getting their photos in the aisle. However, a surprise adjustment to the schedule happened: the kiss was early (middle of the ceremony instead of the very end). Not only that, but as the Bride and Groom were about to kiss, those in the aisle moved in even closer! By quickly moving myself across the back of the church I was still able to get a photo. However, my job is to take the best possible pictures for the Bride and Groom, and there are very rare times when I will very politely ask a guest to move. For example, immediately after the surprise kiss, because I wasn't sure if there would be other surprises that were different than the rehearsal, I did slip up the aisle and ask the guests to be seated. And guess what? They were happy to do so. I have found guests to be very polite, extremely accommodating to me, and easy to work with. During a ceremony some guests may not even realize I am in the back taking pictures - and I have never, ever, had a guest purposefully get in the way of a picture.